All who come to any dance are part of the group. There is no formal organization. Some participate in every dance over many years, some come once, most come back. We maintain a mailing list and e-mail list to share the information. Various people pitch in to help by inviting others to come, by welcoming new dancers, by bringing refreshments, Though Drew Nagle calls mosts of the dances, others are welcome to call when they choose. For 20 years, Illowa Community Folk Dance has brought the experience of an old time barn dance to the greater Quad Cities (Illinois and Iowa). Missing the enjoyment of the dances in Michigan and New Jersey, where they had been active participants, Drew and Maura McGrath Nagle began a series of dances at Prospect Park in Moline. The dancing, from the beginning, has included American Contras, Squares and Circles from all regions and historical periods and British country dances - historical, traditonal and contemporary. 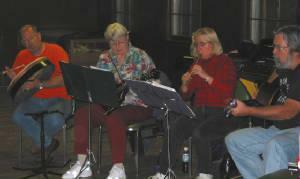 Just 4 Fun - Linda Slack on fiddle, mandolin and guitar; Lila Gehner on banjo; Yvonne Price on harmonica and rhythm instruments; Jean Duncan on bass, Sandy Koseter on guitar and banjo and Chris Clark on guitar, mountain dulcimer, autoharp, and tin whistle. Goosetown Stringband: Foot-stompin' old time music with David Mehaffey (fiddle), Brian Gotwals (banjo), Marc Janssen (guitar), and Melissa Moreton (washtub). Band Ynys Craig Twmpath Dawns – for this occasion various local musicians join forces to play the Welsh and Cornish dance tunes. The name means Rock Island Folk Dance Band.